Rosario let out a soft sigh as she sat in a dark alley way, her sprite, Merlin, sitting on her shoulder. It was about midnight at the time, she didn't feel like sleeping though. As she stood there, she was just thinking some things over. She needed to get some more money, and of course, food, even if that meant stealing. She already had a bad enough reputation, why not try stealing things? It may not be the best idea, but it was the only thing she could think of. Aino Jonckhier meandered through the moonlit streets of Tenebris Em, making sure to manipulate the wind so that no sand would blow into his knee-high military boots. If he was aware of the dirty looks being thrown at him, the young general was ignoring them; he had business to do in the Shadow City, and he wasn't going to let a few meaningless glares stop him from doing his job. The green-haired man stopped not far from one of the innumerable dark alleys (seriously? Dark alleys? Did these Shades have to be so stereotypical?) and fished his golden watch from one of the many pockets of his decorated white uniform, clicking his tongue in agitation as red eyes found the watch's hands. How had it gotten so late? And where the bloody Hell was the Governor's house? Rosario had noticed that a man had stopped near the alley she was resting in. Not just anyone, that is, he seemed to be a highly decorated military officer. He seemed lost, and for a moment, Rosario felt a pang of sympathy for the man. But just as quickly as that feeling came she pushed it to the back of her head. Why should she feel pity for him? She didn't even know the guy. Rosario continued to sit there, watching the man intently. Maybe she could try to steal from him. He must have something valuble on him...like that watch he held in his hand. Hah, as if a Shade would help me, of all people, he thought, not even having to glance around to feel the blatant malice in the warm night air. It was a widely known fact that the desert inhabitants didn't agree with the King's motives or actions, so helping a soldier was probably some sort of taboo. 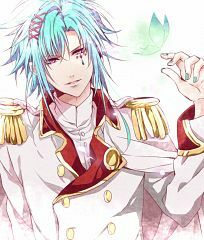 Sitting down against the wall, Aino pulled a sleeping Fermata from his cape and set her on his knee, prodding the white haired butterfly sprite into awareness. If he was going to be late to the Governor's party, he might as well have company. Rosario giggled a bit. The man looked out of place sitting there against the wall. His white (?) uniform was going to get soiled if he sat there long enough. The thought amused her greatly. She shifted her legs, uncrossing them so that they laid straight infront of her as she though of a way to steal something from that man....maybe she could help him..and ask for something in return. That sounded good. At least then she didn't have the possiblity of getting thrown in jail for theiving from a military officer. Aino's eyes narrowed as he felt the shift in air pressure when something moved in the alley behind him. Suspicious, he almost casually placed his left hand on the hilt of his long sword, mentally pushing his sprite to get the hell up. He cast a glance over his shoulder, hoping to spot whatever it was through the inky shadows - which, really, wasn't the brightest idea considering the location, but that didn't matter at the moment. Finally, big leaf green eyes fluttered open and the dark-skinned faerie lifted her petite arms to gently hug his finger, rubbing against it lovingly with her face. "Hello to you too, Fermata," he whispered in reply to her actions, stroking her hair back with the fingers she wasn't holding. "We don't have the time for this right now, though. We should probably be on our way..."
Rosario let a smirk form as she saw the man go into a defensive postition. She glanced down at Merlin, who looked up at her in return. "Wanna go help the officer?" She whispered to the black haired sprite, who nodded hesitantly. Rosario slowly stood, her foot hitting an empty can in the process. Aino flinched at the resounding claaaaaang of something metal skittering across the ground; cursing, he swiftly stood and drew his sword ahile using his other hand to perch Fermata on his shoulder. "Come out," he said, his low baritone voice ice cold. "We know you're there." Rosario's smirk widened as she slowly walked out of the alleyway, the cross on her necknace glinting in the light as she emerged from the shadows. She noticed that he had started to pull out his sword. "Put that thing away, I'm not going to attack." Rosario said with narrowed eyes. "Unless you want me to." She then added, feeling Merlin hide behind her neck, and cuddle into her scarf. She ignored her sprite's shyness, and kept her gaze on the man. Reluctant to relinquish his hold on the blade, the young general let it fall back into the sheath and rested the palm of his hand on the top. "I'd rather not fight someone I don't know," he replied. Giving the dark girl a scrutinizing look, Aino let out a slow breath and stood at attention. "Can I help you?" He asked, more curious than patronizing. "Actually, I was wondering something," Rosario said, staring at the man. "What is someone of your stature doing in this part of the city? Last time I checked, military officers don't hang around here. You lost?" She said, raising an eyebrow. She felt Merlin shift nervously, and nudge her neck gently, it was obvious he didn't like this situation. "The Governer's house?" Rosario said, shifting her weight to the other leg. "I know where that is." She noted the blush that was forming on the man's cheeks. She giggled at this. He was cute like that. She suddebly blushed a bit as she realized what she was thinking, and mentally smacked herself. Now was not the time to be thinking like a giggly teenager. ...that is, the whirlwind of his mind stopped for a moment as the thought surfaced, if she's willing to help me. Suddenly, Fermata flew up around his frame, green butterfly wings glittering as she floated to the girl's neck where a spector - a little Shadow sprite, he realised with a start - hid from view. The tan faerie reached out and touched the other's face, green eyes alight with silent mischief. "Fermata!" He was indignant. Hadn't he taught the sprite about good manners? His shout made the sprite start in surprise, which quickly turned to fear at the girl's accusatory tone. The faerie zipped back to her place on Aino's golden epaulette, looking properly cowed. That situation settled, the prince turned back to the girl. "I sincerely apologise for my...acquaintance's," he sent a scathing look to the sprite on his shoulder, causing her to shrink back, "behaviour. She is rather hands-on with her approaches." "Well," he coughed into his fist, "back to the matter at hand... If you aren't occupied at the moment, would you be willing to lead me there? To the Governor's house?" He reached into his trousers pocket and pulled out a satin coin purse, producing a few gold coins. "I could pay you, if need be." Rosario raised a brow, he was offering her money. She knew that this was an opportunity that she could not miss. "I'll take you to the Govener's house," She said with a sigh. "And I would like to be paid, it's not everyday I get offered money like this." She was happy to finally have someone finally giving her some kind of work. "We have a deal, then." He smiled, placing the bag back into the folds of his clothes and idly sliding the offered coins - five gold coins, merely pocket change to him - between his fingers. "Though I don't doubt your sincerity," he started, handing the girl two of the five gold pieces, "I think it would be wise on my part to give you the rest once we get there. No offence." Rosario smirked a bit, and nodded. "We'd better get going then." She said, adjusting her scarf a bit, so that it was loosened. She opened her satchel, placed the five coins into it. She glanced down at Merlin has he fluttered off her shoulder, and onto her head. Aino patted himself down, clearing the dust and sand from his clothes, before tugging his coat downwards to straighten it and fixing his cape (which disturbed Fermata a bit, but she would get over it). He nodded curtly, through with his assessment, and stepped up to follow the girl. "Are you ready?" Rosario nodded. "I am, but before I begin, I would like to know your name," She said as Merlin landed on her head to rest. "I'm Rosario. Rosario Starr." She added, waiting for his reply. "I am Aino," he responded, gracefully kneeling down and - using his left hand - taking her hand to his lips, as was the customary greeting in Vintes. "Aino Jonckhier, General in Arms of the Vintes Aero Force." And second in line to the throne, he thought about saying, but he decided against it. Only the gods knew what the girl in front of him - Rosario Starr, she said her name was - thought of the royal family. Rosario let a blush rise to her cheeks. She could say that Aino was quite a charming guy. She could give him that. "Well, uh, I guess we should get going." She said, hoping he wouldn't see the blush.